We all know that family meals are a good thing. There’s no question about it. In fact, one of the primary reasons I left my corporate job (which required much travel) was to enable our family to eat dinner together. But it’s kind of like exercise. We know it’s good for us, but we don’t necessarily do it. When it comes to family meals, there are so many obstacles. Soccer practice, dance lessons, art class, staying late at the office, or simply not having the energy to cook are all reasons for stopping through the drive-through and eating in the car on the way to the next activity. Growing up, I knew I could always count on having dinner at home. Even if it was “empty-the-refrigerator day,” there was always something good to eat and an accompanying dinner salad. On Sundays, we had “linner,” often a nicer meal like pork chops or roasted chicken and dessert. Aside from the occasional fighting over the last sautéed mushrooms (there were seven of us! ), we knew there was enough for everybody to be satisfied. You may read this and think: “Her mother was probably a stay-at-home mom and had time to prepare awesome meals every day.” Not so much. My mom worked fulltime as a middle school teacher until she retired at 65. She simply prioritized family meals. She didn’t watch TV or play taxi driver or hit the gym. We didn’t realize how good we had it. For the last several weeks, my family has prioritized family meals. We eat dinner at 6 PM and our 14-year-old is required to be home at this time. (She is allowed to miss one dinner per week.) The result? We are talking and connecting more as a family (big surprise, right?). Sitting together at the table is something we look forward to and cherish – especially since it’s been so long since we’ve been able to do this on a regular basis. During this time, I’ve been reading a book I received from my dear friend Emi. 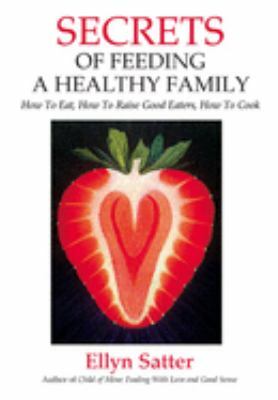 It is Secrets of Feeding a Healthy Family by Ellyn Satter. The primary thesis of the book is that children are born to self-regulate their food intake in a healthy manner and dieting ruins this skill by ignoring and overriding these internal regulators. The ability to self-regulate food intake and maintain ones biologically predestined weight is called “competent eating.” A competent eater takes great pleasure in the eating experience and allows him- or herself to eat as much as he or she wants, but listens to to the body’s cues about satiety. Feel guilty if you must, but at least feel guilty about the right thing. If you have children, you absolutely have to feed them three meals and anywhere from one to three snacks a day. Anything less amounts to neglect. Family meals are more instrumental in adolescents’ positive outcome than socioeconomic status, family structure (two-parent, one-parent, multigenerational), after-school activities, tutors, or church. How to Eat: Teaches eating competence to adults. How to Raise Good Eaters: Explains how to help children remain competent eaters as they grow up in the midst of a culture favoring extreme thinness as the beauty ideal. How to Cook: No-nonsense instructions for the culinary-challenged (like me!) on meal planning, ingredient procurement, and food preparation. I’ve learned a lot from this book and I appreciate the author’s willingness to question ingrained beliefs about nutrition in order to instill confidence in parents. I just wish this book had been around 14 years ago! However, it’s never too late to improve. I would love to hear your experiences with family meals, how you make it work, and what positive effects you’ve seen!